Custom Greeting Cards - Rush Printing on 24 Hour Print! Normally used to convey friendly or thankful messages to different people, greeting cardsare now also being used for different marketing and promotional campaigns. Used by small and medium businesses to call out loyal customers for sales or special offers, greeting cards have become effective tools for marketing and targeting a subset of a business' market. 24 Hour Print offers folded and flat greeting cards that can be used for either marketing or personal use. These greeting cards having sizes ranging from 7" x 5", 8.5" x 6", and 10" x 7" for folded greeting cards, and 3.5" x 5", 4" x 6", 4.25" x 6", and 5" x 7" for flat cards can be ordered from 50 to 5,000 prints. You can opt to include a 4 Baronial envelope for both folded and flat cards. Thick 14 pt. and 13 pt. card stock in printing the greeting cards. 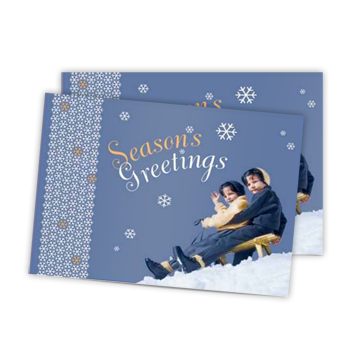 For sending out short holiday messages to your customers or business partners, flat cards are great. We also offer custom Christmas cards for the upcoming holiday season. Print personalized greeting cards for your family and friends using our folded card option. If you're looking for a template, you can download our free template. You can use these prepress-approved templates as a proper guide for your greeting card’s bleeds and margins prior to printing. You can contact us at 1-844-380-7056 if you have further questions. We will be happy to assist you with your customgreeting cards printing service needs.